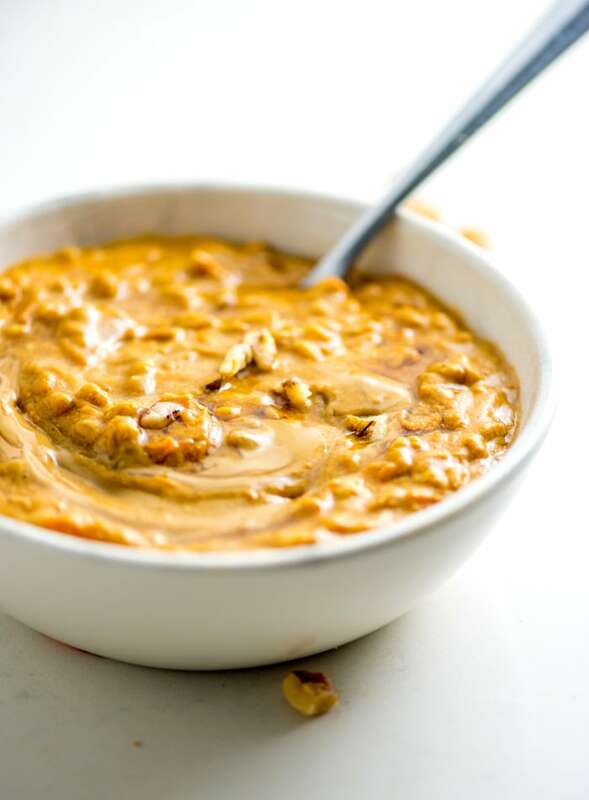 These 5-minute vegan pumpkin breakfast farro bowls land somewhere between rice pudding and classic stovetop oatmeal and are the perfect way to use up leftover cooked grains. This recipe is vegan, high in protein, and high in fibre. Farro, or emmer wheat, is a delicious, nutty, chewy whole grain that’s rich in fibre, B vitamins, iron, magnesium and zinc. It’s cooked much like other grains, using 1 part farro to 3 cups water, simmered stovetop until tender. When compared to today’s modern wheat, farro is higher in fibre and protein and lower in gluten. It also contains a specific type of carbohydrate that can help lower cholesterol levels and balance blood sugar levels. When compared to quinoa, it’s nutritional profile is very similar in macronutrients and vitamins but it has double the calcium content. You can read more about the benefits of farro in my guide to whole grains. I often have leftover farro from making my Mediterranean Farro Salad Bowls and I love using the leftovers for breakfast. I also like to cook a big batch of whole grains every week as part of my food prep, alternating between grains like farro, brown rice, quinoa, barley, bulgur and freekeh. You can use any of these cooked whole grains to make this recipe. Pumpkin. I used canned pure pumpkin to make this recipe. 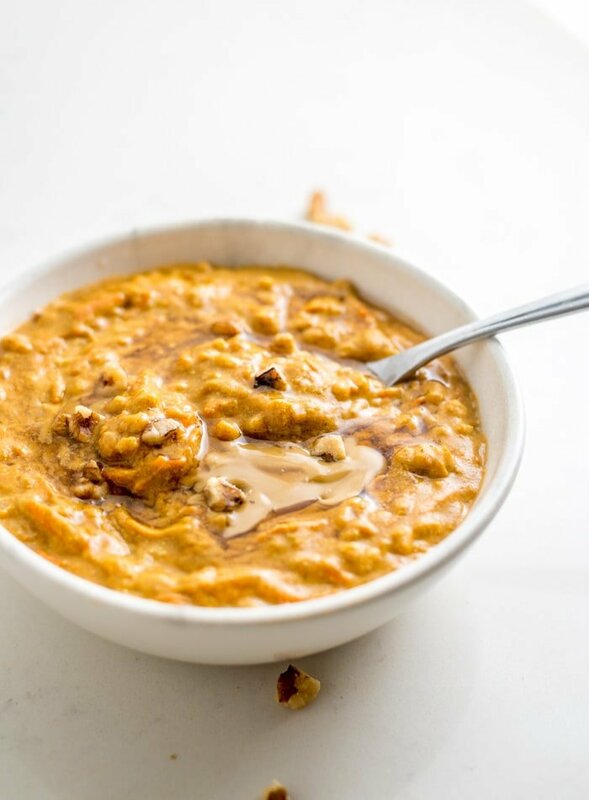 Pumpkin is my favourite addition to oatmeal and whole grain porridges as it adds fibre, flavour, nutrients and creaminess for very minimal calories. Vegan vanilla protein powder. I almost always add a whole food vegan protein powder to recipes like this. I use it to sweeten the recipe so I don’t have to add an additional sweetener, and to add more protein of course. 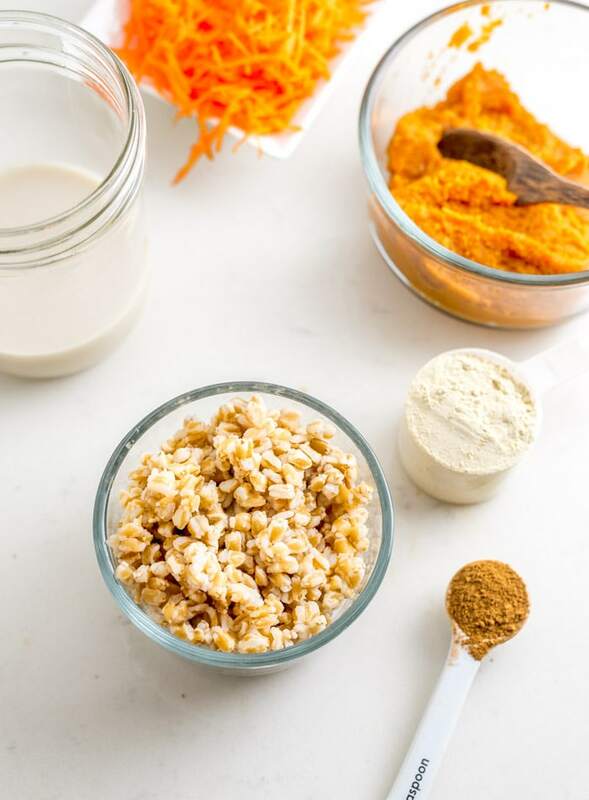 You can make this without protein powder but I’d suggest reducing the liquid used to 1/3 cup, then slowly adding more as needed, and adding a sweetener such as unprocessed stevia, maple syrup or coconut sugar. Read more about vegan protein sources in my guide to the best vegan proteins. Cooked farro. I used 3/4 cup cooked farro to make this recipe. Alternatively, you can use cooked brown rice, quinoa, bulgur, barley or freekeh. 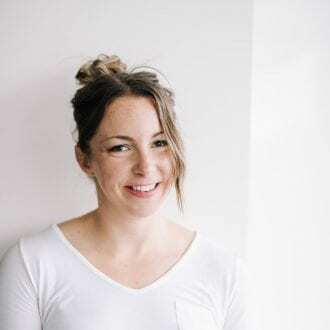 Farro is a great choice if you’re on a budget too, it’s cheaper than quinoa but provides many of the same health benefits. Read more: Healthy Eating on a Budget. Cinnamon. Cinnamon adds that cozy, warm flavour we all love so much. If you can get your hands on some true (ceylon) cinnamon, awesome, as it has more nutritional flavour than everyday cinnamon. Regular cinnamon is just fine too though and will definitely do the trick. Sea salt. I used a good pinch of sea salt in this recipe and while it’s optional, I just love the way sea salt enhances the flavour of meals like this. Plant-based milk. I used unsweetened almond milk in this recipe but you can use any plant-based milk you like. Cashew, hemp, soy or rice all work. Carrot. If you’ve been a Running on Real Food reader for a while, you know I never miss a chance to add veggies to a recipe, so of course, I had to sneak some grated carrot into this. Read this post for the many nutritional benefits of carrots! You could also use grated zucchini or a mixture of the two. Farro takes 30 minutes to cook from scratch but this recipe calls for leftover cooked farro, making it quick, 5-minute breakfast. All you need to do is add all the ingredients to a pot, heat it up stovetop and serve. I love it topped with some chopped or sautéed apples and walnuts, peaches or banana and almond butter, sunflower seed butter or tahini. It’s hearty, warming, comforting and makes a beautiful, nourishing Fall breakfast. Have some leftover farro you need to use up? 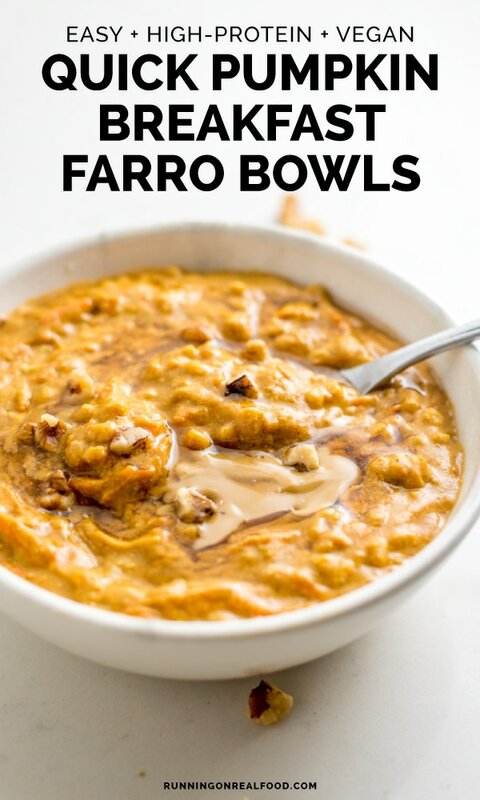 Try it for breakfast in this cozy, healthy breakfast farro bowl! 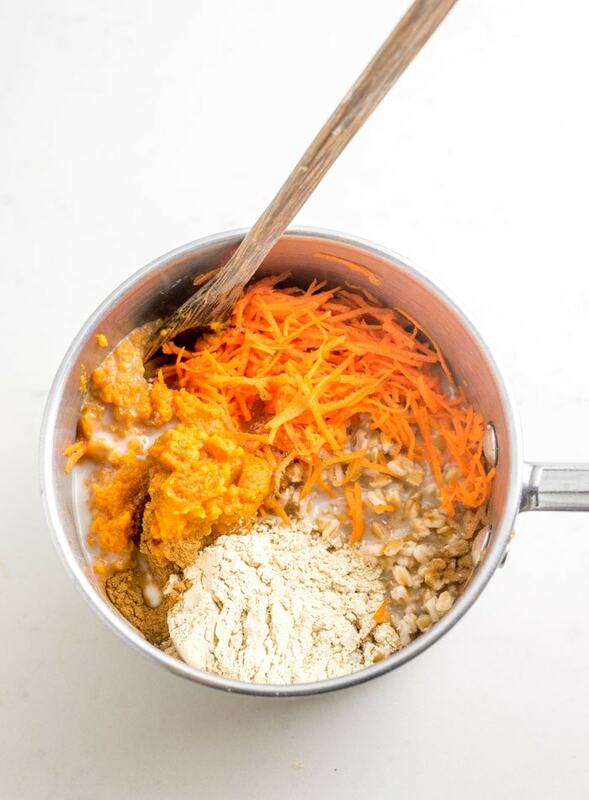 I added pumpkin, carrot, protein and cinnamon for a delicious, filling, balanced breakfast that is perfect for a cozy morning. Add all ingredients to a small pot and heat it up stovetop, stirring frequently until heated through.